We hear the word inflammation tossed around a lot these days. But what exactly is inflammation and why should we be concerned? Inflammation is a process through which the body’s white blood cells and chemicals work at protecting us from foreign substances such as viruses and bacteria as well as infections. The chemicals from the white blood cells increases the blood flow to the injured area or area of infection resulting in slight warmth and redness as well as swelling in the tissues. These increased cells within the injured area…like an injured joint, irritate the area causing swelling of the joint lining and eventually wearing out the cartilage that protects the bones. In autoimmune diseases, like arthritis, the immune system will trigger an inflammatory response even though there are no foreign substances to fight. The results are that the immune system normally used to protect us actually causes damage to its own tissues. Obviously, out of control inflammation in the body is not a good situation to be in and eventually leads to ill-health. Certain foods we eat actually cause inflammation in our bodies. Foods laden with sugar and saturated fat triggers inflammation. Are there steps we can take to reduce the amount of inflammation in our bodies? There are actually anti-inflammatory diets to address this very issue. 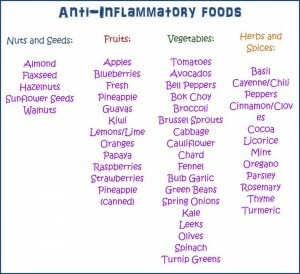 However experts agree that anti-inflammatory eating is more effective at solving some health issues more than others. Although each diet is presented slightly different, they all are based on the same basic concepts…that inflammation if not treated eventually leads to more serious health related issues while eating certain foods will help avoid constant inflammation and promote better health. What are these super foods that can help us with keep inflammation in check? 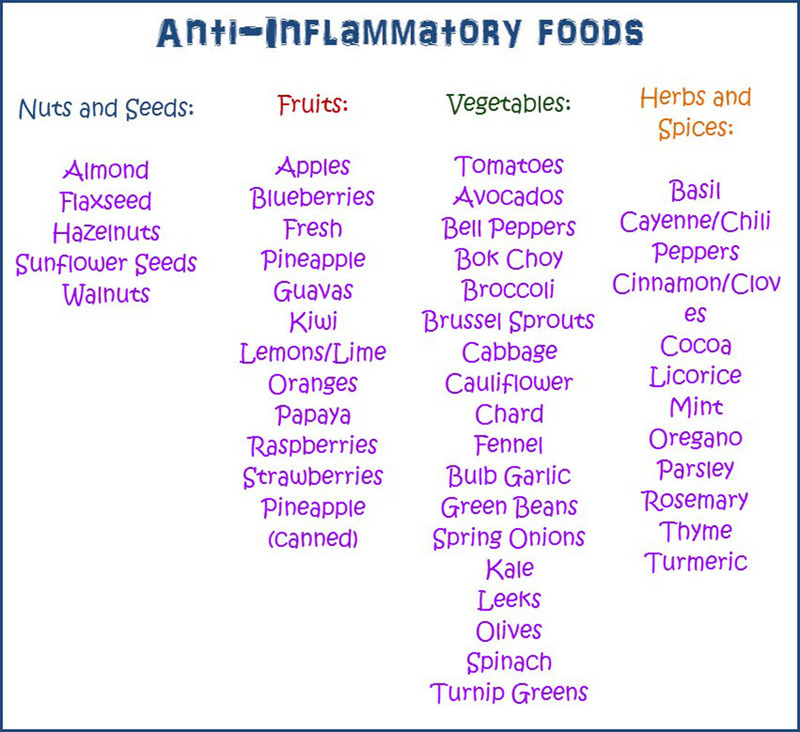 Anti-inflammatory foods can be found in fruits, veggies, fish, nuts and seeds (not surprising) as well as herbs and spices. Other foods like oily fish and certain meats…Salmon, Halibut, Mackerel, Shrimp, Tuna, Lamb and Cod are all included in anti-inflammatory super-foods. In order to capitalize on the benefits they provide you must eat them a few times a week. Another good choice is whole grains as opposed to refined, processed ones like white bread, cereal and rice. And of course always pay attention to your dark leafy greens as listed above. Studies suggest that vitamin E plays a role in protecting us from pro-inflammatory molecules called cytokines…and dark green leafy veggies like spinach and kale are great sources. Cruciferous veggies offer so much in the way of vitamins and minerals along with disease fighting phytochemicals that it’s not surprising to find them on the anti-inflammatory list. Inflammation is an important part of our body’s defense mechanism but like anything else, when it gets out of control and unbalanced it causes damages rather than relieving pain. 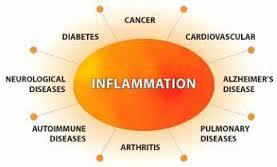 Inflammation is also thought to play a role in heart disease, cancer and obesity. Paying attention to what you eat and incorporating lots of anti-inflammatory foods into your diet is an important step and just one of the things you can do to protect yourself against inflammation and the serious effects it has.